America’s top military officer told a Senate panel overnight the Obama Administration is evaluating whether to conduct “direct kinetic strikes” against the Syrian regime. Republican Senator John McCain of Arizona said he would block Dempsey's nomination for a second term as Joint Chiefs of Staff chairman until the general gave his personal opinion on what the U.S. should do in Syria. McCain, who supports a stronger role in supporting opposition rebels, accused the Obama administration of inaction in Syria and questioned the quality of advice Dempsey has provided to the White House over the past two years. He said the risks of inaction in Syria outweighed risks the United States would face in engaging more actively in supporting rebels. "We have not been inactive," Dempsey countered. The White House has said it will arm rebels, but opposition leaders in Syria say they have yet to receive those weapons and momentum is shifting toward President Bashar al-Assad. Dempsey later acknowledged that the "tide seems to have shifted in his favor.” He also said the momentum ebbs and flows between the two sides. McCain expressed concerns that Dempsey's advice on arming rebels has shifted. When pressed again by McCain, Dempsey – in a not-so-subtle reference to Iraq – asked the senator whether he would agree "that situations could be made worse by the introduction of military force?" McCain said the general disagreed with him in a similar debate in 2006 over whether to send some 20,000 more U.S. troops to Iraq to quell violence in Baghdad an al-Anbar province. President George W. Bush ultimately ordered the deployment, which was known as "the surge" and credited it with helping to turn the tide of the war. "I think history shows that those of us who supported the surge were right and people like you who didn't think we need a surge were wrong," McCain said. McCain asked Dempsey whether regional destabilization is a "good outcome" of the Syria conflict. "Senator, somehow you've got me portrayed as the one who's holding back from our use of military force inside of Syria,” Dempsey said. "We've given [President Obama] options," Dempsey said. "The members of this committee have been briefed on them in a classified setting. We've articulated the risk. The decision on whether to use force is the decision of our elected officials." McCain reminded Dempsey that the general agreed at the beginning of the hearing to provide the committee with his personal opinion, if asked. "I'm asking for your opinion," McCain said. "About the use of kinetic strikes?" Dempsey asked. "That issue is under deliberation inside of our agencies of government and it would be inappropriate for me to try to influence the decision with me rendering an opinion in public about what kind of force we should use." McCain took the parting shot. "If it is your position that you do not provide your personal views to the committee when asked, only under certain circumstances, then you have just contradicted what I have known this committee to operate under for the last 30 years," he said. McCain told reporters after leaving the hearing room he planned to put a hold on the nomination, essentially blocking any further action until he gets an adequate response from Dempsey. "I want to see him answer the question," McCain said. Seeking a compromise, Sen. Carl Levin, D-Mich., the committee chairman, asked Dempsey to provide the panel by early next week with an unclassified list of options and the general's assessment of the pros and cons of each. Levin made clear he is not asking Dempsey to share his personal opinion on whether or not to use force in Syria. Dempsey agreed to provide the list. Levin said he hoped the assessment from Dempsey would give McCain "greater reassurance." The outgoing head of the British Army said in turn the West would need to fight a war against Assad if it wanted to have a "material impact" on his calculations. In interviews to two British newspapers, General Sir David Richards said there were arguments for and against such a course of action and the British government was still debating its options on Syria. But if a political decision was made to try to change the tide of the conflict to put pressure on the Syrian government, which has notched up military gains in recent months, Britain would need to intervene in the same way as it did in Libya, he said. 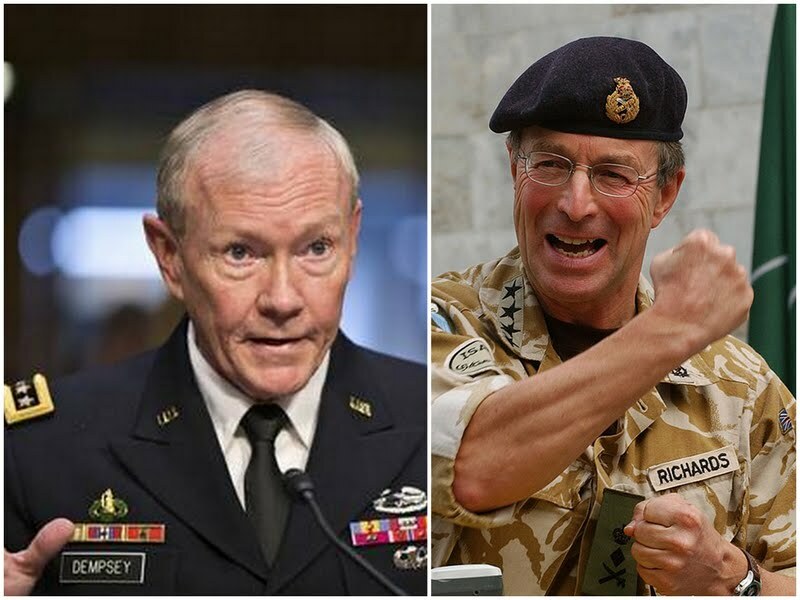 The 61-year-old general said in an interview with The Daily Telegraph there was "a lack of international consensus" over how to act over Syria but a shared reluctance to see Western boots on the ground. “If you wanted to have the material impact on the Syrian regime’s calculations that some people seek, a no fly zone per se is insufficient. “You have to establish a ground control zone. You have to take out their air defenses. You also have to make sure they can’t maneuver – which means you have to take out their tanks, and their armored personnel carriers and all the other things that are actually doing the damage. Richards described the situation as “highly complex” and suggested that the focus of government action was also on ensuring the conflict did not “spread” to neighboring countries. Richards separately told The Sun newspaper that Britain “would have to act” if it saw chemical weapons proliferation as a result of the Syrian conflict. And he also revealed planning for a major new operation in the war-torn country, which Special Forces would lead, is well underway. Richards said, “The risk of terrorism is becoming more and more dominant in our strategic vision for what we might do in Syria. “If that risk develops, we would almost certainly have to act to mitigate it and we are ready to do so. "I think it is a very big question. If we saw chemical weapons proliferate as a result of what is happening in Syria then we would have to act. Pressed on whether that meant a brand new theater of war for the armed forces, the general added: “Some could characterize that, even though it might be for a limited period, as a war”. Britain is only likely to act alongside the US, Richards suggested, adding: “We would have to do it as part of a wider effort because you know the scale of the challenge would be too much for any one country.